I didn't begin using makeup until I was about 15/16 and subsequently developed the belief that I couldn't be seen without it. Even if I were in hospital I'd have at least the base on. Wearing makeup does affect my confidence and so, I was eager to have Sophie work her magic on my face! The look she did was 110% out of my comfort zone, but I liked it. 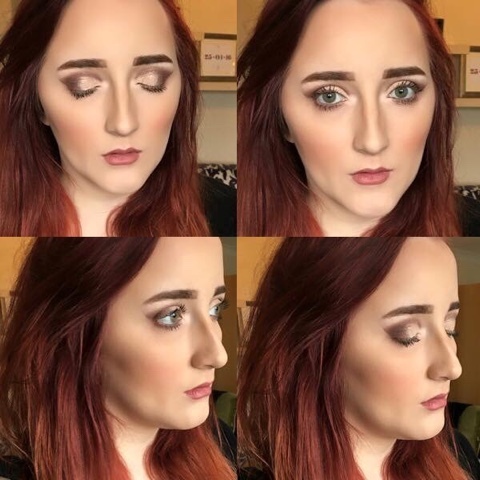 It was amazing to see how the contouring she did seemed to completely change my face shape! Hi! 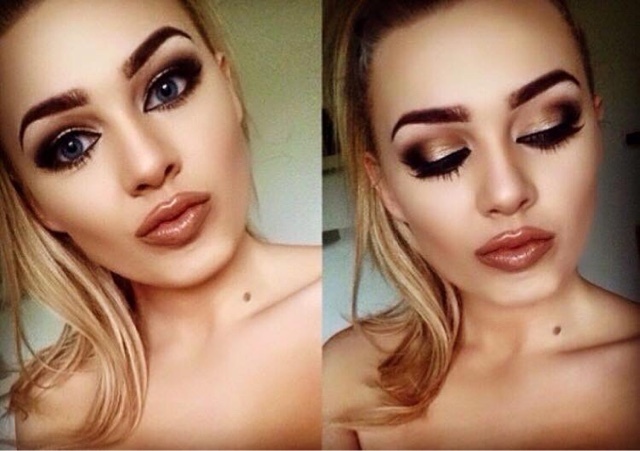 I'm Sophie, a skin specialist, makeup artist, and brand new beauty blogger! I am honoured to be writing a blog post for such an inspirational, successful blogger who I am proud to call my best friend. And I feel that this the perfect time to share not only my story, but my journey! Right now, I am in love with the path I am walking and the cards I have been dealt, but I fought tooth and nail, day and night to get here. At school I was bullied to the extreme. So much so, I moved schools twice. I was ridiculed for being fat, and for being ugly. It came from all peers; boys and girls. The bullying was horrific; I'd walk into the girls toilets and 'Sophie is a fat slag' would be graffitied all over the walls, my hair was cut and once even spray painted, I had things thrown at my face and groups of the bullies would throw stones at the windows when I was at home. Inevitably, and as is common these days, the bullying spread to social media. There were pictures of me posted online so that people could call me fat and ugly in the comments and then a full page was created and was dedicated to people telling me to 'do the world a favour' and kill myself because I'd be 'better off dead. I was so low from the constant bullying that in time, I totally agreed with them. I was bullied because of my physical appearance and unfortunately, in lots similar cases the victim doesn't get through it; but with amazing support, I came through the bullying. I reached the other side. My dad used to give me a pep talk every day when he was taking me to school. He used to say 'when these people are doing what they are doing to hurt you, just think of where you will be in 10 years, and where they will be. Because people who act like that in life will amount to nothing, and the people like you who show strength and battle the through will be the ones who make it'. I have worked so hard at re-building my life after the bullying. I've been a homeowner since the age of 18 and I have worked full time to support myself since I was 16. I'm now 23 and I'm currently studying a mental health nursing degree whilst working as a makeup artist and skin specialist. These aspects of beauty are SO important to me, and I have so much passion and interest around this because without makeup, skincare and nutrition, I would never have had the confidence to do what I'm doing now. This is my incentive: to use my skills and experience in this area to help others to have a confidence boost. This keeps me going. What do I want this post to achieve? For someone who is going through what I went through and sees no way out; to see that they can be someone. YOU can be someone. You can inspire others, whether it be on a small scale, or a large scale. And do you know what makes my story even better? Those same people that once called me fat and ugly. Who threw things at me. Who told me I would be better off dead; are now coming to ME for advice. They're asking ME to help them. They seek inspiration from ME to help improve their own lives.